Radiation levels at Half Moon Bay in California are registering at 8 times their normal levels. 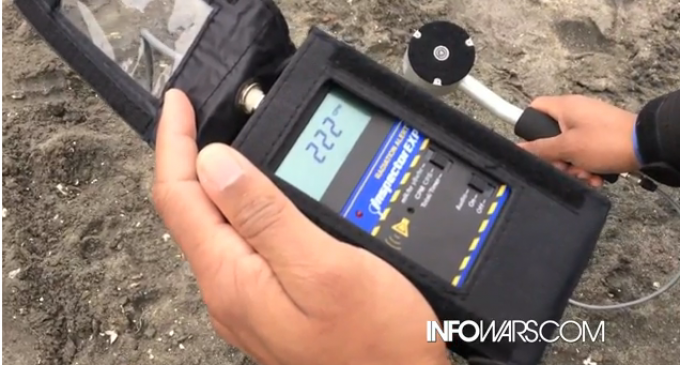 Earlier this month we posted videos of people taking readings on another California beach and in Missouri, both showing very high levels of radiation. After the Fukushima disaster occurred, there were predictions that a radioactive ocean plume would hit the west coast of the U.S. sometime in 2014. This could be that drifting plume. Another cause of this could be from a large plume of steam that Tepco, the company managing the Fukushima disaster, stated came from reactor 3 last month. At the same time the US government ordered 14 million doses of potassium iodine. Radiation get stuck in the atmosphere and comes down with rain and snow. Helps if we get radiation poisoning because the damn liberals in our state will do nothing! Makes me wonder about all the dead fish washing up! Just be glad we live in the central valley! But are these dangerous levels or just higher safe levels? Fukushima has been spouting massive amounts of Radiation since the moment the reactors melted down. They can’t stop it and nothing can be done about it. Real Life! Your bodies can only handle 400 rads anything above that your body starts to burn.